Find Combo Package for Physics, Chemistry & Biology is based on the analysed report of the Question Papers from the previous 3 years of CBSE Class 12th Board exam. This conceptually exclusive product will help the students to excel with highest attributes in their concerned Papers. This Combo Package for Physics, Chemistry & Biology is based on the analysed report of the Question Papers from the previous 3 years of CBSE Class 12th Board exam. This conceptually exclusive product will help the students to excel with highest attributes in their concerned Papers. Q. 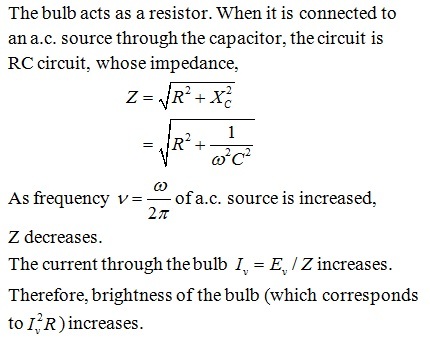 A bulb and a capacitor are connected in series to an a.c. source of variable frequency. How will the brightness of the bulb change on increasing the frequency of ac source? Q. What would happen if no salt bridge were used in an electrochemical cell (like Zn–Cu cell)? If no salt bridge were used in electrochemical cell, the metal ions formed by the loss of electrons will accumulate in one electrode and the negative ions will accumulate in the other. Thus, the solution will develop charges and the current stops flowing. Moreover, inner circuit is not completed. Q. 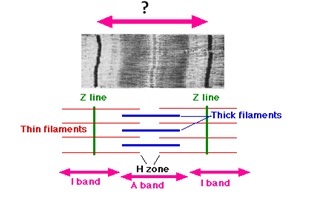 The actin filaments are attached to a protein named as Z lines or membrane of krouse. The dark region consists of heavy protein that is myosin. Can you label the region between two Z lines in the given diagram.